Install Facebook Messenger Chat on WordPress with WP-Chatbot — & One Click! WP-Chatbot by MobileMonkey is the fastest, simplest way to add Facebook Messenger chat to your WordPress site! From your website, visitors can chat you, your live support team or your chatbot using Facebook Messenger. Why Facebook Messenger Chat on Your Site? 1.3 billion Facebook Messenger users: That’s active monthly users! Your visitors around the world are using Messenger. Unified inbox: Whether people message you from your website chat, Facebook page or other entry point, one inbox contains all the conversations. Persistent conversation history: Unlike other chat programs, your customers’ chat history remain in Messenger, regardless of when and from what device they message you. Team-friendly inbox: Everyone on your team can have access to conversations through the Facebook business page. If you’re using Facebook Messenger chat for customer service, product recommendations, promotions and marketing, WP-Chatbot is the best way to add Messenger chat to a WordPress website. This WordPress plugin has an easy install and setup, meaning it’s easy to add Facebook Messenger chat to your WordPress website and applications. With WP-Chatbot, the power of Facebook Messenger chat is a plugin install away. 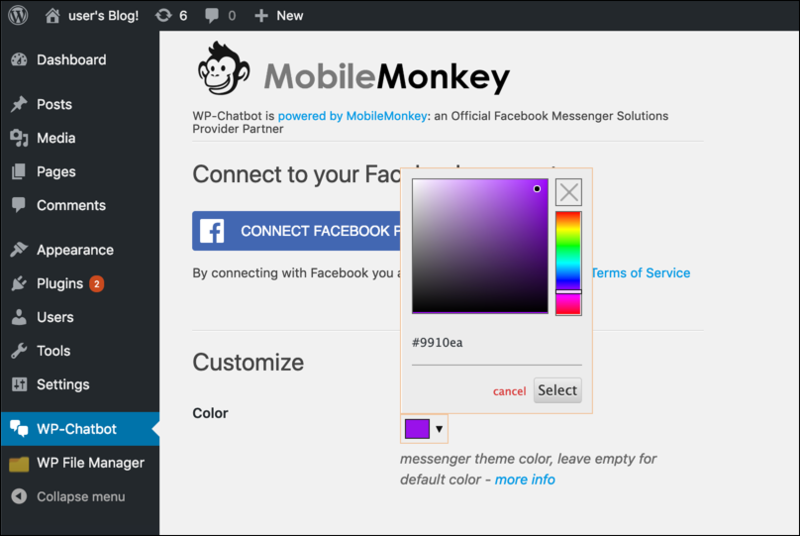 Your brand comes to life in your WordPress site chat when you choose your branded colors for the Messenger icon and chat now button. Want to set up an automatic “howdy” when people message you from your WordPress website chat? Done in a snap within the WP-Chatbot plugin settings! Your Facebook page profile image automatically displays as the photo in the chat window! This Facebook page connection to your website chat makes it easy to update while staying consistent with your overall branding. The power of Facebook Messenger chat for business is magnified when you add a Facebook bot to the equation! Then you not only have the ability to reach over a billion people around the world and save chat history to a universal inbox. You can also create a chatbot programmed to automatically answer FAQs, generate leads, qualify leads and alert sales team about hot leads, make appointments, track shipments, and lots more. Connecting a chatbot to your WordPress website is seamless with MobileMonkey’s full integration to WP-Chatbot. Give it a try by logging into your free, new MobileMonkey account. Hide Messenger based on post type, post ID, categories, Device Type. WP-Chatbot by MobileMonkey is a 5-star rated WordPress plugin! Here’s what the WordPress developer community is saying. This is simply the best plugin for quick chat directly connected to your Facebook page chat. If you’re using facebook bot for the chat this is perfect! Thank you guys for your amazing work! Keep it up! So happy that I found your plugin! I’ve been procrastinating on site chat because I figured it would be a pain, but it turns out it’s a lot easier than I thought. In my industry it takes 12-18 touches to turn someone into a buyer, so every new channel I can set up is gold. This is a great plugin for Chatbot. Doesn’t impact pagespeed and is simple to set up. A very useful plugin to chat with current and new customers off of your WordPress website. These developers are truly passionate about this project. They’re responsive and efficient in resolving issues – Would definitely recommend using this plugin. The plugin is installed and works as advertised. I’m happy :-). WP-Chatbot is automatically connected to MobileMonkey, the fastest-growing official Facebook Messenger Solutions Provider. Just log into MobileMonkey with a Facebook account and connect your Facebook business page. See MobileMonkey features list for both free and Pro plans here.